It appears that the decisions made by the former head of the FBI regarding Hillary Clinton’s email server investigation were affected by his expectations regarding the 2016 presidential elections. The decision made by the FBI leadership to look back into the Hillary Clinton email investigation shortly before the presidential election was affected by James Comey’s faith in her impending victory, the agency’s former director himself said during an exclusive interview with ABC News three days ahead of the release of his book titled A Higher Loyalty: Truth, Lies, and Leadership. "I don’t remember consciously thinking about that, but it must have been because I was operating in a world where Hillary Clinton was going to beat Donald Trump, and so I’m sure that it was a factor," Comey said. According to him, it appeared obvious at the time that Hillary Clinton was "going to be elected president", thus making him reason that burying the investigation might make her "illegitimate the moment she’s elected, the moment this comes out." Many social media users however took a dim view of Comey’s revelations and of his book as a whole. James Comey admits in his new book that he regrets calling Hillary Clinton's handling of classified information "extremely careless." Too bad he’s a spineless coward. — Educating Liberals (@Education4Libs) 15 апреля 2018 г. Worst piece of fiction I have ever had the pain to read. Looks to be penned by a Hillary Clinton speechwriter. — 72 SECONDS (@55true4u) 15 апреля 2018 г. Imagine the irony of Comey, calling Trump a mob boss, while burying mob queen Hillary's mountainous evidence of criminal activity. — PinkAboutIt 🇺🇸 (@Pink_About_it) 15 апреля 2018 г. — Oliver McGee PhD MBA (@OliverMcGee) 14 апреля 2018 г. ​Earlier, US President Donald Trump himself had a few unflattering remarks to make about Comey on Twitter. ​In her book What Happened, Hillary Clinton blamed former FBI Director James Comey for having an impact on her loss in the presidential race by announcing his intent to reopen a previously closed investigation related to her activities as government official. 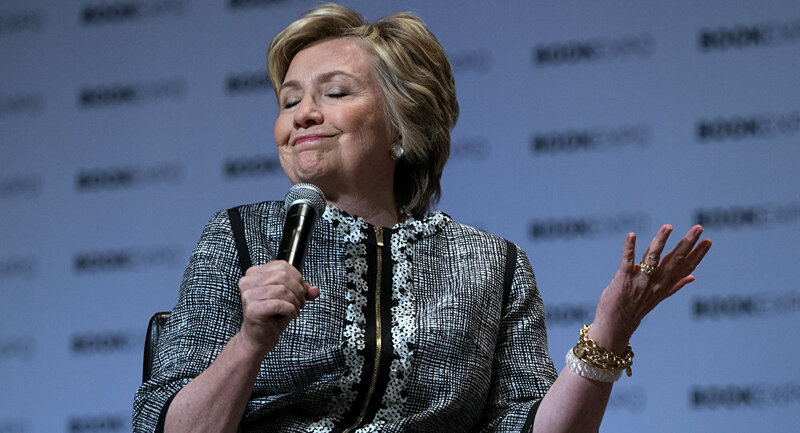 During her tenure as the US Secretary of State from 2009 to 2013, Hillary Clinton used a private server and email accounts for official business, which became the focus of an official FBI investigation into the potential mishandling of classified information. The agency however closed the investigation in July 2016, and concluded that while Clinton was "extremely careless," it would not recommend filing any charges. On October 28 that same year however, mere days before the election, then-Director of the FBI James Comey sent a letter to congress declaring that the agency would be looking back at the email investigation.